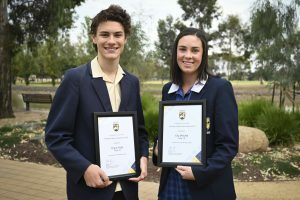 Year 11 students, Elly Miecheland Angus Hatty have been selected as recipients of the Spirit of Anzac Prize for 2018, a competition run by the Victorian Government Department of Premier and Cabinet. The competition process required a written submission about an Australians perspective and experience of war. Over 500 students from all over Victoria entered the competition and short-listed entrants were required to participate in a group interview. Elly and Angus were part of the final group of 22 students and their achievement will see them take part in an overseas tour to Vietnam and Singapore in the 2019 April school holidays. On February 14, Elly and Angus were presented with their Spirit of Anzac certificates by Member of Parliament Robin Scott at a presentation ceremony in Melbourne. Congratulations Elly and Angus on this fabulous achievement, we look forward to hearing of your travels when you return.